By NNA Staff on October 26, 2011 - Mollie Shields-Uehling is President and CEO of SAFE-BioPharma Association®, which provides digital identity solutions to government organizations and the healthcare and pharmaceutical industries. By NNA Staff on October 26, 2011 - Michigan Governor Rick Snyder signed a set of Notary-related laws late last week designed to combat real estate fraud. By NNA Staff on October 26, 2011 - Washington State enacted a new Immigration Service Fraud Prevention Act this week, prohibiting individuals from engaging in the unauthorized practice of law in matters pertaining to immigration. By NNA Staff on October 25, 2011 - Many people are confused over the differences between surety bonds and errors and omissions insurance. For Notaries, the differences are crucial. Here’s what you need to know. Hotline Tip: What Do I Need To Know About Using An Embosser? By NNA Staff on October 25, 2011 - When using an embosser, do I also need to use my ink stamp when notarizing? Does the embossment need to be done within the Notary block? Is there anything else I need to know when it comes to embossing? 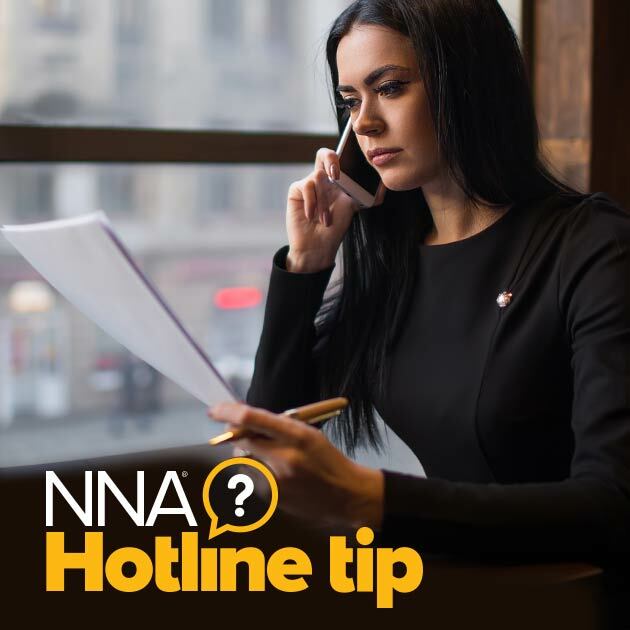 By NNA Staff on October 19, 2011 - Notaries in healthcare environments often encounter signers with physical issues, making it difficult for them to pen their signature on a document. But this issue is generally not a cause to refuse the notarization. By NNA Staff on October 19, 2011 - A California hospital faces a multi-million dollar class action lawsuit after private patient information was supplied to a business contractor and posted on the Internet, an indication of how sharing sensitive patient information — even with trusted business partners — can put you in danger of violating healthcare privacy regulations. By NNA Staff on October 19, 2011 - New York State has enacted a new law that permits county recorders to electronically accept real estate-related documents and paves the way for electronic notarizations. By NNA Staff on October 19, 2011 - In an effort to protect elderly persons from being exploited, the state of Florida enacted a new law this month that changes the way powers of attorney are executed and notarized. The NNA’s Healthcare Professionals Section spoke with elder law attorney Howard Krooks to discuss the changes in the new law and how it may affect powers of attorney notarized in other states. By NNA Staff on October 19, 2011 - The Financial and Corporate Services Section spoke with Steven Camp, partner in the Dallas office of Gardere Wynne Sewell LLP, about emerging trends in identity theft, certain safety precautions Notaries should take to protect themselves and the public, and how companies can better detect and deter identity theft.